Feed Smart, Inc. is a Texas based family owned business. Owners Rick and Suzanne Mock, who have over 60+ combined years in the horse industry saw a real need for an innovation in feeding horses and other livestock. They bred Thoroughbreds, racing in Texas, Louisiana, and Oklahoma, and were painfully aware of how much grain concentrate it takes to keep these athletes in top form. Their busy lifestyles, complicated by tighter budgets for most these days, made it a great time to explore the idea of an automated feeding system based upon a very personal experience. 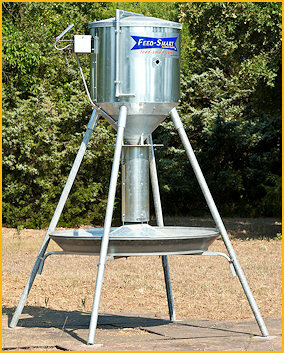 The Feed-Smart Automatic Feeder is the result of a personal tragedy for its inventors, Rick & Suzanne Mock. On January 11, 2008, while they were out of town on business, they received a phone call about 5pm from the people who were looking after their horses for them. Their best broodmare, in foal to Early Flyer, the leading first-crop Thoroughbred stallion in Texas at that time, had fallen ill. She was rushed to the veterinarian, but it was too late. The mare had to be put down, and the foal, due in March, was lost as well. 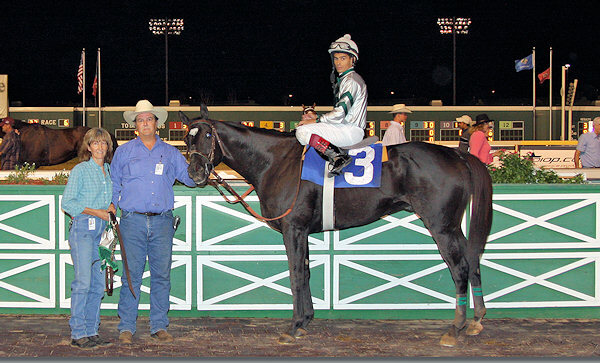 The mare, Lou Villa, was the dominant horse in a pasture of three. According to the vet, she had most likely become agitated during that morning’s feeding, consumed her grain very quickly, and run the other horses off, allowing her to eat far more grain than was healthy for her. The grain overload had triggered a painful bout of colic so bad that she had aspirated fluid into her lungs, thus complicating her condition. It was a tragic loss for the Mocks and their racehorse-breeding program. From that one tragedy, Rick and Suzanne set about creating a better way to take care of feeding their horses in a healthier and safer manner. Through a lot of effort they put the first prototype Feed Smart feeder in operation in the spring of 2008, feeding four daily meals to their personal horses. From then until now, they have had NO colic episodes at their farm. There is no way they they would go back to feeding only twice a day. A Feed Smart Automatic Feeder is a one-time investment in the well-being of your horses. It will keep your horses happy & healthy, while allowing you to live a "guilt-free" life, no longer having to feed late or skip feedings. You'll find that your feed stays fresh in the Feed Smart hopper for many weeks, due to the hopper design & the fact that the feed moves at each feeding. As with any automatic feeder, you must use a loose, dry feed in it, like an uncoated pellet or oats. 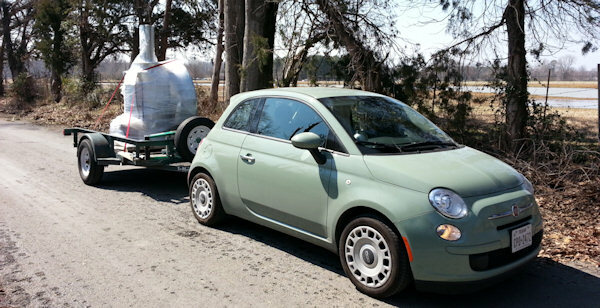 It's a 2013 Fiat 500 "Pop". It easily tows the utility trailer, with up to 3 Feed Smart feeders on it. We have delivered feeders as far 550 miles away with this setup. Customers are ALWAYS shocked to see what pulls up at their farm when we deliver & set up their new Feed Smart feeders!